The NewGroup add-in adds the New horizontal/vertical tab group commands to the Tabs Studio context menu for the selected tab/extension if commands are available. For example, the New horizontal tab group command is not available when vertical tab groups already created and both commands are not available when there is only one tab in a selected group. In Tabs Studio you can open a tab context menu without making the tab selected – in this case the two new commands are not shown as it is much harder to determine if they should be available in this case. Download the NewGroup add-in for VS 2010. Looks like a great add-in. Could you provide easy instructions to actually add in the add-in? The VS2010 Add-in manager does not appear to do the job. Click Add-in installation folder in Add-in Manager. Copy NewGroup.dll to the opened folder. Is there a way to make a tab group floating? No, it is not currently possible. 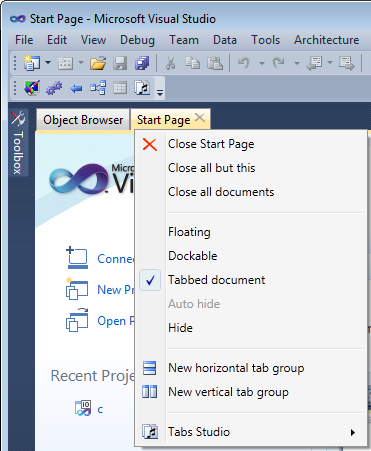 A floating tab group will be available with Visual Studio 11 – see Document tabs in Visual Studio 11 Developer Preview.